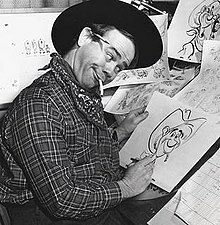 Ward Walrath Kimball (March 4, 1914 – July 8, 2002), born in Minneapolis, Minnesota, was an animator for Walt Disney Animation Studios. He was one of Walt Disney's team of animators, known as Disney's Nine Old Men. His films have been honored with two Academy Awards for Best Animated Short Film. Outside of his job as an animator, Kimball was a railroad enthusiast as well as a talented jazz trombonist. He founded and led the seven-piece Dixieland band Firehouse Five Plus Two, in which he played trombone. While Kimball was a brilliant draftsman, he preferred to work on comical characters rather than realistic human designs. Animating came easily to him and he was constantly looking to do things differently. Because of this, Walt Disney called Ward a genius in the book The Story of Walt Disney. While there were many talented animators at Disney, Ward's efforts stand out as unique. Kimball was included in the team of animators known later as Disney's Nine Old Men, whose original task was animating Snow White and the Seven Dwarfs (1937). The film was the first feature-length animated film by the Disney studio. Kimball spent months working on the sequence animation for a scene where the Seven Dwarfs are eating soup, prepared for them by Snow White. This scene, however, was ultimately left out, since it would have come after the sequence in which the dwarfs washed their hands. Kimball was profiled by producer Jerry Fairbanks in his Paramount Pictures film short series Unusual Occupations. This 35mm Magnacolor film short was released theatrically in 1944; it focused on Kimball's backyard railroad and full-sized locomotive. Kimball was also a jazz trombonist. He founded and led the seven-piece Dixieland band Firehouse Five Plus Two, in which he played trombone. The band made at least 13 LP records and toured clubs, college campuses and jazz festivals from the 1940s to early 1970s. Kimball once said that Walt Disney permitted the second career as long as it did not interfere with his animation work. Kimball appeared on the March 17, 1954, episode of You Bet Your Life, where Groucho Marx coaxed him into playing his trombone with the house band. He and his partner won $75 in their quiz portion of the show, including one Disney animation question that Kimball answered easily. Kimball continued to work at Disney until 1974, working on the Disney anthology television series, being one of the writers for Babes in Toyland, creating animation for Mary Poppins, directing the animation for Bedknobs and Broomsticks, and working on titles for feature films such as The Adventures Of Bullwhip Griffin and Million Dollar Duck. His last staff work for Disney was producing and directing the Disney TV show The Mouse Factory, which ran from 1972 to 1974. He continued to do various projects on his own, even returning to do some publicity tours for the Disney corporation. He also worked on the World of Motion attraction for Disney's EPCOT Center. While his only two acting appearances on film were an uncredited role as a jazz musician (with his Firehouse Five Plus Two) in Hit Parade of 1951 and as an IRS Chief in Mike Jittlov's The Wizard of Speed and Time, Kimball served as host of the " Man in Space" and " Man and the Moon" episodes of Disneyland in 1955 and 1956 respectively. He hosted the second season of the 1992 PBS series Tracks Ahead. That season has since been repackaged to feature current host Spencer Christian. As recounted in Neal Gabler's biography of Walt Disney,  Ward Kimball was a key figure in spreading the urban legend that Disney had left instructions for his body to be preserved by cryonics after his death. Note: At the time these films were produced it was common for one animator to animate every single character in the shot. I hope I can hold out for the big one, the great earthquake. Then when California slips into the Pacific Ocean, then me and all my trains can fall into the great abyss and into oblivion. ^ "Ward Kimball". Telegraph.co.uk. Retrieved 2017-07-17. ^ "Definitive Biography Of Animation Icon Ward Kimball To Be Published In 2018". Cartoon Brew. 2017-07-14. Retrieved 2017-07-17. ^ " Ward Kimball's Final Farewell", Hogan's Alley #11. ^ SOLOMON, CHARLES (2002-07-09). "Ward Kimball, 88; Key Disney Animator". Los Angeles Times. ISSN 0458-3035. Retrieved 2017-07-17. ^ a b c ""Escalation": This 1968 anti-war animated film by Disney legend Ward Kimball is as timely as ever". nightflight.com. Retrieved 2017-07-17. ^ "It's Tough to be a Bird". 2008. Retrieved 6 January 2008. ^ "Ward Kimball - Art Afterpieces". 2013. Retrieved 14 August 2016. ^ Gabler, Neal: Walt Disney: The Triumph of the American Imagination (Random House, 2007). ^ "Pre-Order "Full Steam Ahead!," the Ward Kimball Biography". cartoonbrew.com. Archived from the original on 2012-04-05. Retrieved 2012-04-03. ^ Amid Amidi: "Yes, Chronicle Books nixed the publication of my book... Yes, it's my opinion that Disney's pressure caused Chronicle to kill the project... Yes, I am amused by the Disney Company's inept attempt to control the personal histories of its artists...."
^ Amendola (2015), p. 120. ^ "Treasure Hunt: Walt Disney called Ward Kimball a 'genius,' but he was just a normal train collector | Reading Eagle - BERKSCOUNTRY". Reading Eagle. Retrieved 2017-07-17. ^ a b Broggie, Michael, Walt Disney's Railroad Story, Virginia Beach, VA: The Donning Company Publishers, 2006 (2nd edition), pp. 52–59, 200. ^ Steam Passenger Service Directory, 1967, p. 18, Empire State Railway Museum, Inc., New York, NY, 1967. ^ Broggie, Michael. Walt Disney's Railroad Story: The Small-Scale Fascination That Led to the Full-Scale Kingdom, pp. 122–24, 150, 335, 2nd Ed., The Donning Company Publishers, Virginia Beach, Virginia, 2006. ISBN 1-57864-309-0. ^ "The Beautiful Billy Jones Wildcat Railroad at Vasona Park - 18" Gauge Live Steam in Los Gatos - 60p". www.youtube.com. CaptainHarlock999. 31 December 2015. Retrieved 27 June 2017. ^ Dowty, Robert R., Rebirth of the Jupiter and the 119: Building the Replica Locomotives at Golden Spike, Tucson, AZ: Southwest Parks & Monuments Association, 1994, p. 35. ^ Vallen, Mark (6 July 2016). ""Hey, Hey, LBJ"". www.art-for-a-change.com. Retrieved 12 June 2018. ^ "Ward Kimball's Escalation". cartoonbrew.com. 10 February 2007. ^ Mello, Michael, "New generation works Disneyland's rails" Archived 2012-01-19 at the Wayback Machine, Orange County Register, Local, 26 November 2011, p. 4. ^ "Today's Orange County business briefs", Orange County Register, 16 February 2006. ^ Eades, Mark, "Disneyland Railroad engineers fire up the locomotives every morning" Archived 2012-02-06 at the Wayback Machine, Orange County Register, 1 June 2010. ^ "Kimball Family Collection". Academy Film Archive. Pierce, Todd (2019). The Life and Times of Ward Kimball: Maverick of Disney Animation (1st ed.). University Press of Mississippi. ISBN 978-1496820969.
" Man and the Moon"